As days are passing , All learners must be looking for NIOS Deled 504 505 solved model/sample paper for their revision of course. NIOS has scheduled its second semester Examination for 504 505 in September 2018. Datesheet is available on official website of NIOS. Link will be shared in the post for all of you. 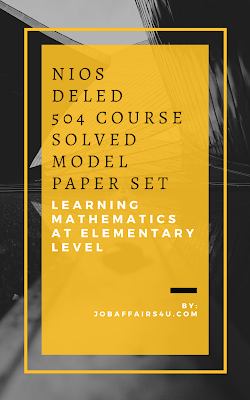 Today, I am sharing As days are passing , All learners must be looking for NIOS Deled 504 505 solved model/sample paper for their revision of course. for all of you. From the First semester , I am sharing needful study material for all NIOS DELED teachers. Solved Guess paper are very helpfull in preparing any exam. NIOS Deled 504 505 solved model/sample paper that given here contains all Important MCQ, Short Answer Questions and Long answer Questions. These Solved Model papers will give you complete revision of the DELED 504 505 course. There will be 70 marks theory question paper in main examination with 3 hours duration. PAYMENT PROCESS IS FULLY SECURE AND POWERED BY INSTAMOJO. YOU CAN DO PAYMENT VIA CREDIT CARD/DEBIT CARD, NET-BANKING, MOBILE WALLETS, UPI AND NEFT. On Next screen , click on the BUY button. Enter your Name, E-mail and contact number. Click on continue button and complete payment by choosing your appropriate method. After successful Online payment, File Download button will appear. Click on the download File button and PDF file will get downloaded. Purchase receipt with Download Link will be delivered to your Entered mail-id also. Files are in PDF format and printable. Sample papers are available in both HINDI and ENGLISH. A total of 11 Solved Question Papers are given for Both 504 and 505. MCQ, Short Answer Questions and Long questions are given completely solved. After PAYTM Payment send a mail to ernavneet1990@gmail.comwith your last 4 digit paytm number and Required model set. Price mentioned above. Solved Paper will be delivered to your mailbox within 5 minutes .